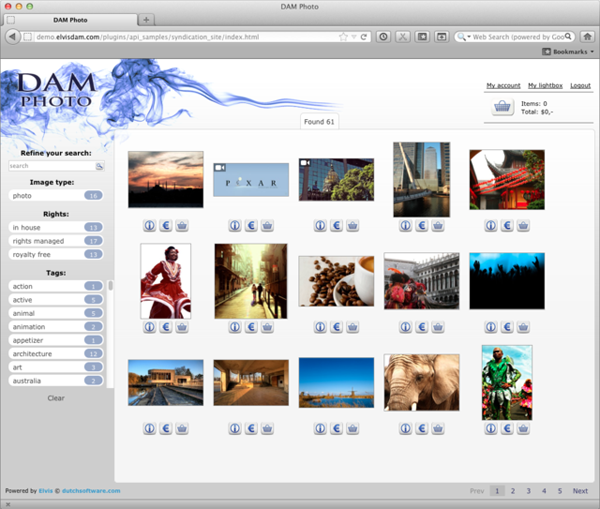 DAM photo is an image and video oriented distribution or 'stock photo' site. Allows searching, filtering, previewing and buying material. How to filter a search with various facets. Uses an off-the-shelf jQuery based lightbox to display previews, supporting both images and videos. How to use result paging. Extends the HitRenderer to display custom buttons below the thumbnails. Uses auto-login so all visitors are authenticated using a guest account.